Jalapeno poppers are some of our favorite appetizers. Unfortunately, frozen, processed jalapeno poppers are loaded with fat, preservatives and sodium--and restaurant ones are often deep fried and just as unhealthy. While our jalapeno poppers are certainly not the healthiest snack on our blog--our version cuts a lot of fat from the appetizer by ingredients alone--and then bakes them in the oven rather than using a deep fryer. We are also submitting our Oven Baked Jalapeno Popper Recipe with Chicken and Cream Cheese as our J entry in the Blogging from A to Z challenge. J is for Jalapeno! Prepare the Peppers. Split each jalapeno pepper lengthwise and carefully remove and discard the seeds and pepper membranes. Mix the Cheese and Chicken filling. Combine the cheeses, chicken, onion, garlic powder and bacon bits in a medium mixing bowl. Mix briskly with a fork until well combined. Fill the jalapeno halves. Place approximately a tablespoon of the cheese and chicken mixture into the center of each jalapeno pepper. Coat the peppers. Using shallow bowls, place a bowl of flour, beaten egg and bread crumbs in an assembly line-style row. 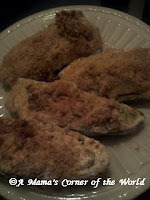 Dredge the peppers in the flour, then dip them into the egg, and finally coat each pepper with bread crumbs. Bake the peppers until tender. Lightly spray a baking sheet with cooking spray. Place each jalapeno filling side up on the baking sheet. Bake at 350 F for 40-45 minutes or until peppers are tender and coating is golden brown.